The bacteria in and on our bodies have been shown to be vital for human health, influencing nutrition, obesity and protection from diseases. But science has only recently delved into the importance of the microbiome of plants. Since plants can't move, they are especially reliant on partnerships with microbes to help them get nutrients. 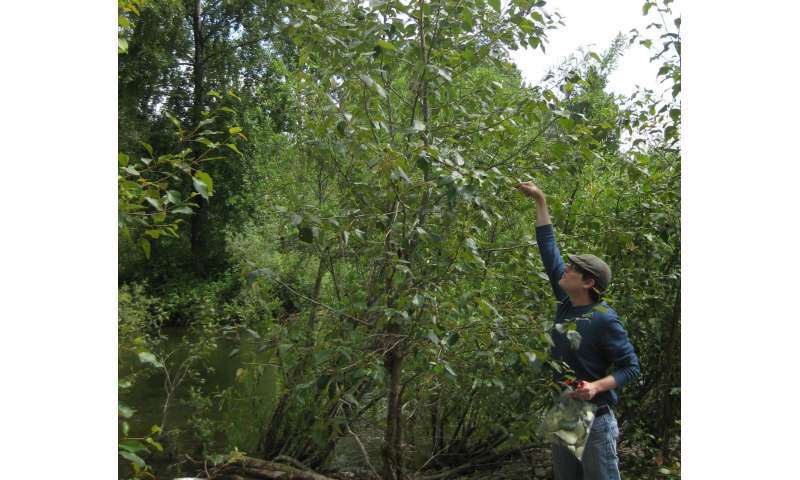 Now, University of Washington plant microbiologist Sharon Doty, along with her team of undergraduate and graduate students and staff, has demonstrated that poplar trees growing in rocky, inhospitable terrain harbor bacteria within them that could provide valuable nutrients to help the plant grow. Their findings, which could have implications for agriculture crop and bioenergy crop productivity, were published May 19 in the journal PLOS ONE. "This variability made it especially difficult to quantify the activity, but is the key to the biology since it is probably only specific groupings of microorganisms that are working together to provide this nutrient to the host," said Doty, a professor in the UW School of Environmental and Forest Sciences. It's well documented that nitrogen fixation happens in bacteria-rich nodules on the roots of legumes such as soybeans, clovers, alfalfa and lupines. Bacteria help the roots fix atmospheric nitrogen gas into a form which can be used by the plant. This could have significant implications for common agricultural crop plants. The microbes the team has isolated from wild poplar and willow plants help corn, tomatoes and peppers, as well as turf grasses and forest trees to grow with less fertilizer. "Having access to the key microbial strains that help wild plants thrive on just rocks and sand will be crucial for moving agriculture, bioenergy and forestry away from a dependence on chemical fertilizers and towards a more natural way of boosting plant productivity," Doty said.